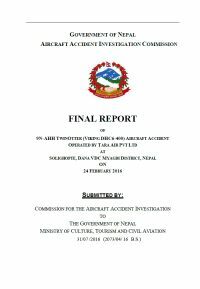 A Viking Air DHC-6 Twin Otter 400, operating Tara Air flight 193, was destroyed in an accident in the Myagdi district, Nepal. All 23 on board suffered fatal injuries. The aircraft departed at 07:50 hours local time from Pokhara Airport (PKR) on a domestic 20-minute flight to Jomsom Airport (JMO), Nepal. The copilot acted as Pilot Flying, the captain as Pilot Monitoring during the flight. En route the flight deviated to the left and climbed to 12000 feet to avoid clouds. Over the Ghorepani area the GPWS began to sound. The aircraft was flying through clouds with a little visibility in between and a descent to 10000 feet was initiated. At 10200 feet the GPWS sounded again but the captain responded not to worry about it. The captain was used to hearing these warnings in normal flight, so it became a habit to disregard the warnings. About one minute before the accident the captain took over control and initiated a climb. The aircraft impacted a mountainside at 10700 feet, coming to rest at an elevation of 10982 feet. According to a statement by the airline, the aircraft crashed near Tirkhe Dungha, Dana VDC of Myagdi district. The Commission concludes that the probable cause of this accident was the fact that despite of unfavourable weather conditions, the crew's repeated decision to enter into cloud during VFR flight and their deviation from the normal track due to loss of situational awareness aggravated by spatial disorientation leading to CFIT accident.